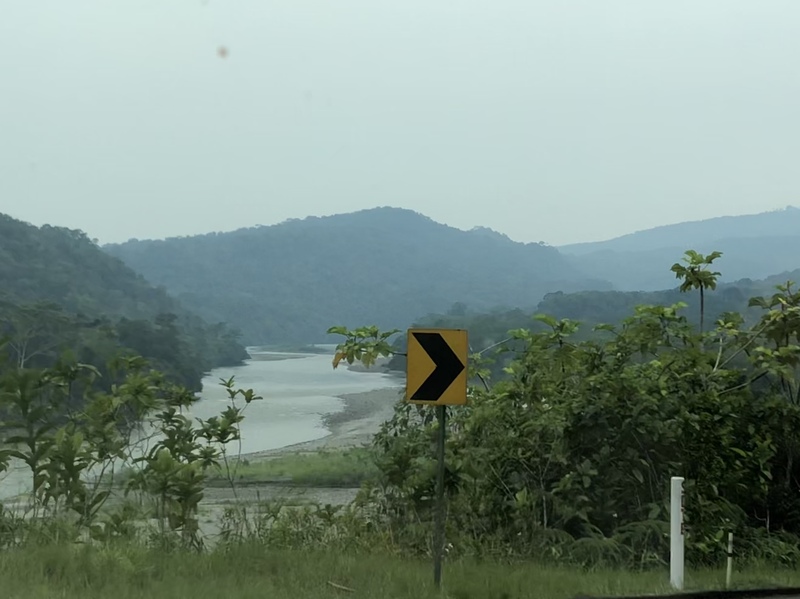 On our way to Ecuador, the road from Mocoa to San Miguel was paved, with rough breaks now and then. It was not near as remote as we had believed it to be, with hamlets and farms all the way along. It turned out to be a beautiful five hour drive. Migration and customs for Colombia and Ecuador are in one building just inside of Ecuador. 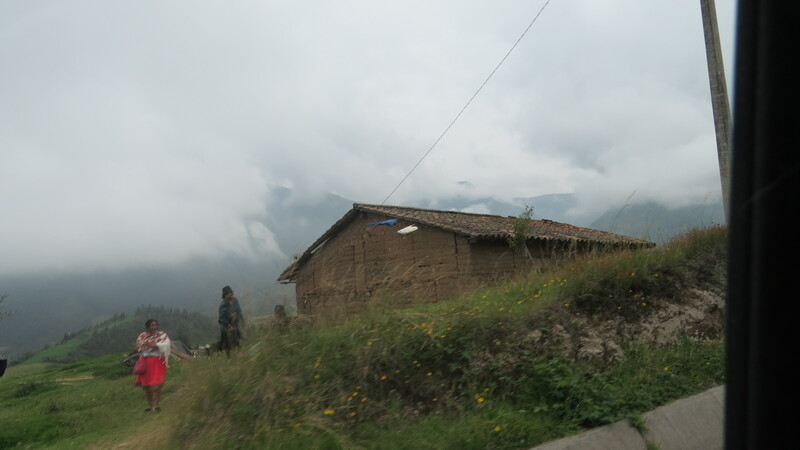 We had an inkling that Ecuador might be different as we approached the building. Security had a tight command. About two dozen Venezuelans, some with children, hung around the entrance, quietly waiting in a long line, for their opportunity to enter the country. Bob and I were immediately directed to stand in a short line and soon we were allowed to enter the building. The room was orderly. When a child would not stop screaming, the clerk asked the mom to leave the room. Wow, we had not seen that at any border before. Stamping in and out was quick. Then at the Customs desk down the hall we waited for our new vehicle permit. A man was teaching a woman about the process. It is in moments like this that we have gained a new appreciation for the difficulty in interpreting international documents, in someone else’s language. These two officials poured over our documents, but then asked, where is the plate? What is the model? And we would point out where, to us, our paper clearly provide the information. So I laughed, not at them, when we received the typed copy. At the top of the vehicle permit is typed Gilbert Plains, my birthplace. Which has nothing to do with Vanna. 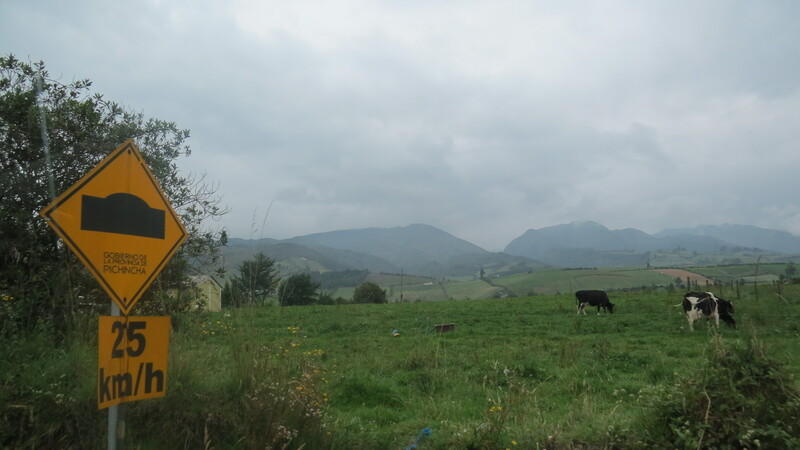 Crossing the country from the Amazonia to the west, we drove along the southern edge of the Cayambe-Coca Ecological Reserve. The scenery was spectacular. The highway followed a gorge, crossing the river many times. The sides were steep and covered in vegetation of ferns, trees, and vines. A large round brown pipe snaked along the roadway, transporting oil from the Amazon. 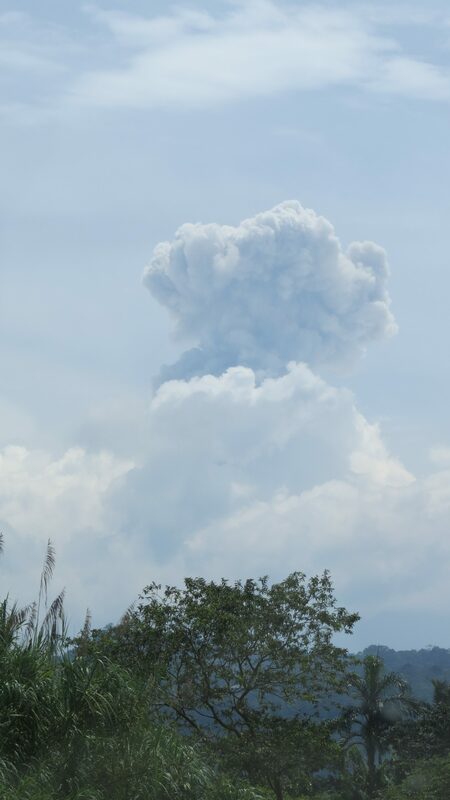 Ahead we noticed billows of grey smoke rising from a volcano as it burst its contents upwards. 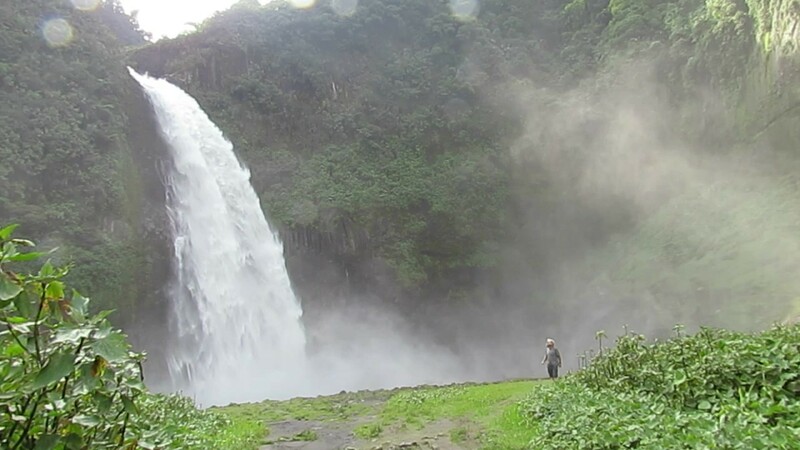 The first night we took a dirt path off the highway to see a gorgeous waterfall, which spewed and sprayed from a rock ledge above. 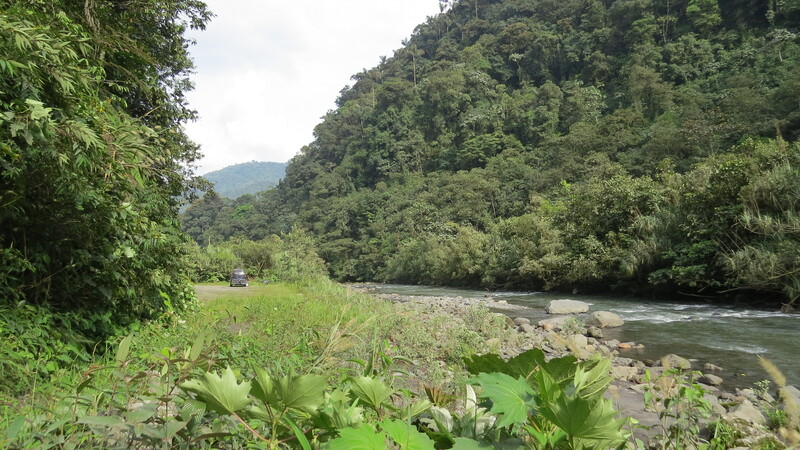 We camped there by the river, surrounded by the steep forest and the sounds of rushing water. We were the only ones there. Except for the jungle vegetation it reminded me of camping in the Rockies. I wondered if we would see a bear. But there were no signs, not even animal prints in the river bank. The next night we stayed in the parking lot of a mountain resort hotel and thermal spa. Eight blue tiled pools were built into black rock, and spread over different levels. Each had its own temperature of water, from ice cold to scalding. We spent all afternoon soaking and talking. A young couple from Alberta in a decked out Sprinter van, were headed to Argentina and trying to get their skis shipped there so they can enjoy the mountains. 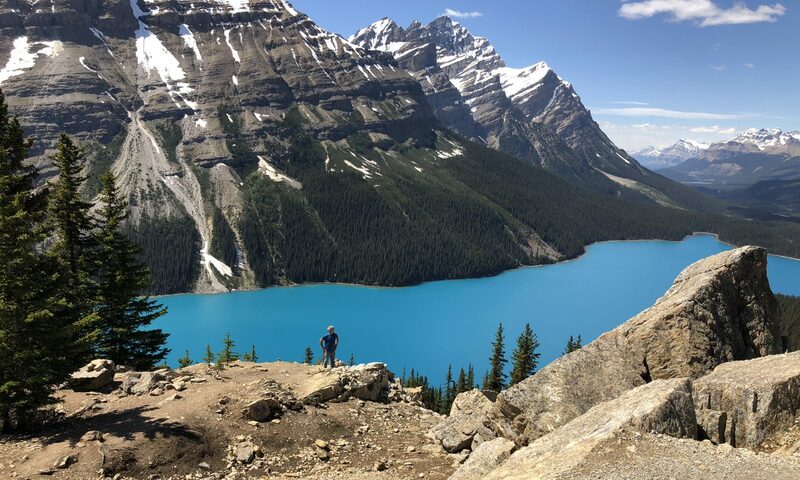 A family from Chicago on spring break with their two teenage sons shared their hiking adventures that had brought on altitude sickness. And we chatted with two Ecuadorian families. 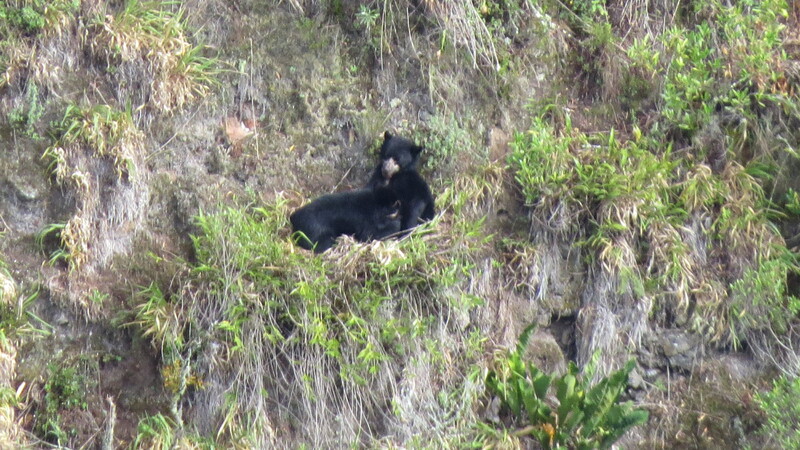 I mentioned to the locals that I wanted to see the Andean bear. My hopes were dashed when they answered, “So do we”. 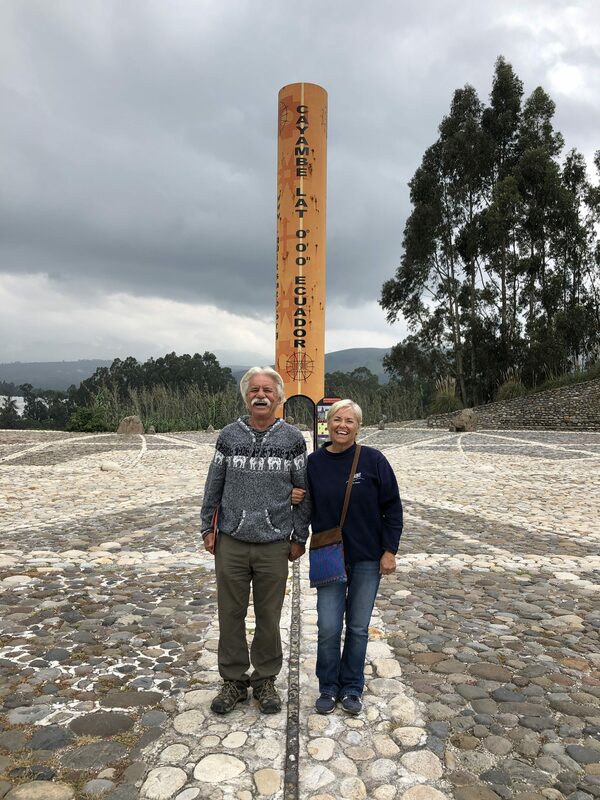 We stopped at the equator just for photos, but ended up getting educated. The enthusiastic guide showed us how they had used satélite to construct a huge stone sundial. The dial is located right on the equator, unlike another unmentioned equatorial monument in Ecuador. Near the city of Ibarra, we stayed several nights at a very popular Overlander camp called Sommerwind. The camp offers a restaurant that sells homemade bread and German platters. Hans, the owner was always smiling and infinitely helpful. Across the road from Sommerwind was an international auto race track. When the cars were running, the noise in camp was deafening. So on Sunday, the day of a big race, we sat in the stands, picked our winners and watched them lose. It was actually quite entertaining. At Sommerwind, we met a Brazilian couple with a Sprinter van they had built themselves. It had a bathroom and an oven. Luxury. Another couple, Lars and Karen, from Switzerland, had a white Mitsubishi van more like Vanna. 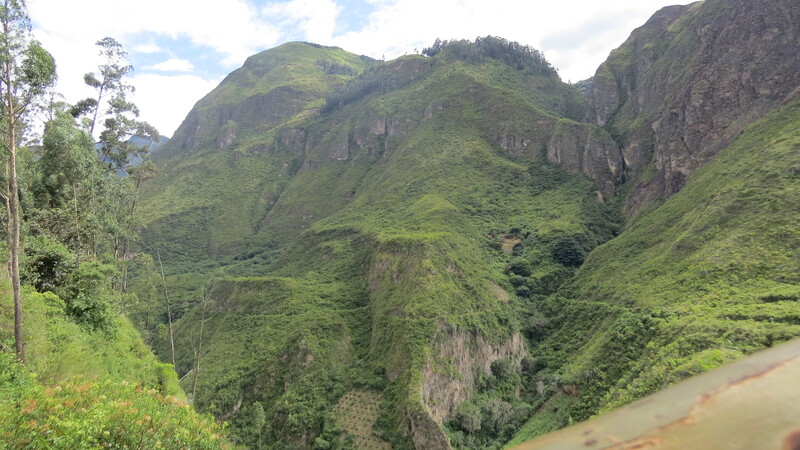 Lars mentioned that they had just returned from the Mirador del Oso Andino. “Did you see bears?” “Yes, wild ones.” We were hooked. Lars showed us the location on Maps.me. The map showed a thin white line of a road for only part of the way. “Just follow the signs”, he said. We left the next day headed north from Ibarra. 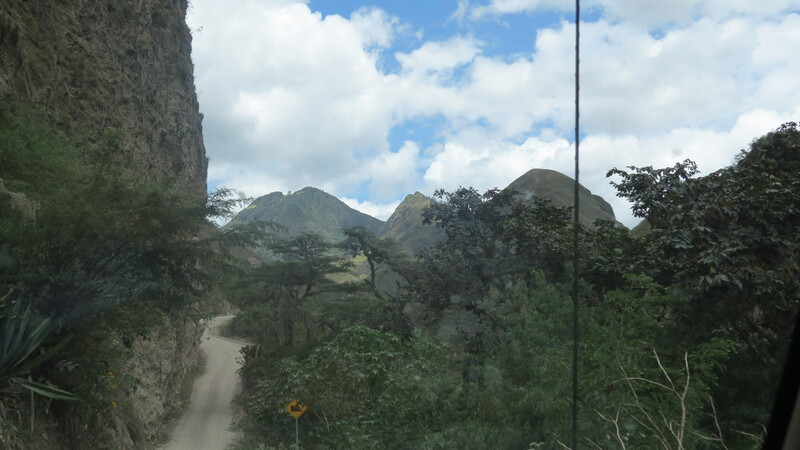 At Juncal we turned south on a secondary road which was paved for the 8 km to the village of Pimampiro. From there it was a dirt road, a cliff winder, up and down, crossing the river, then up again. A few times we had to backtrack. But whenever two or three tracks intersected, there were official looking signs, which was comforting. Sometimes we had to guess. “Does that arrow point that way…or that way”. In places the road was laid with stone, a kind of bumpy pavement. We drove way into the hills, and wondered who would possibly live out here. But then fields appeared, and a scattering of homes. Finally a wooden hand carved sign pointed us down a mud track into a field. 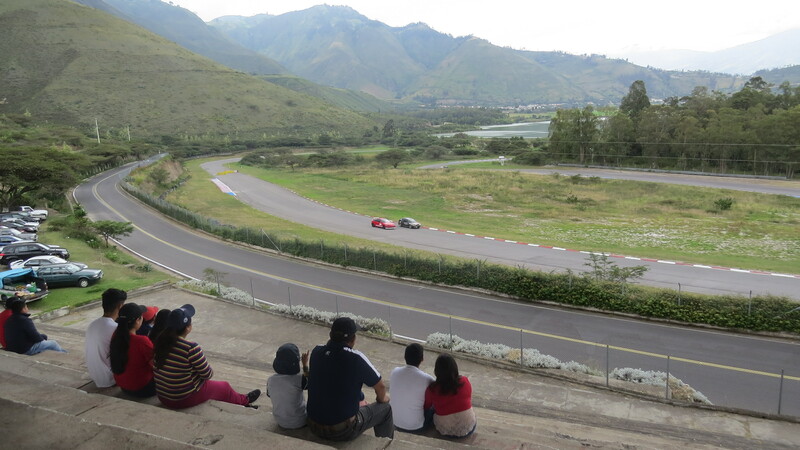 We parked on the grass by the Mirador. The Mirador turned out to be a platform built into a tree. We climbed the wooden steps, and spent the rest of the afternoon and all the next morning up in that tree. From there we looked across the deep gorge, and over the clear rushing river, to the wide steep mountain on the other side. It was sheer rock and forest. Over the two days we met a Japanese film crew, here to make a video about the bears. Their smiling local guide showed us how to see the bears, lending Bob her binoculars while I hoarded ours. Way across, we could see round black forms moving along the green mountainside. She told us that the two sows were named Gabriel and Martina. Then she hurried off after the crew, who had set up huge cameras on a ledge below. On the right hand mountain face, we could sometimes see Gabriel, wearing a tracking collar. She was with her 8 month old cub. 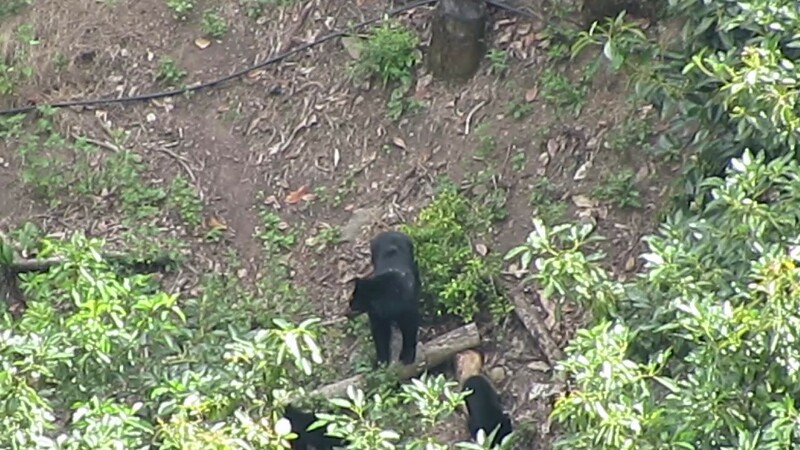 In the morning we excitedly watched as the cub nursed, wandered off, and returned to nurse again. All the while Gabriel lay comfortably on a sunny grassy ledge, caressing her baby when it came near. 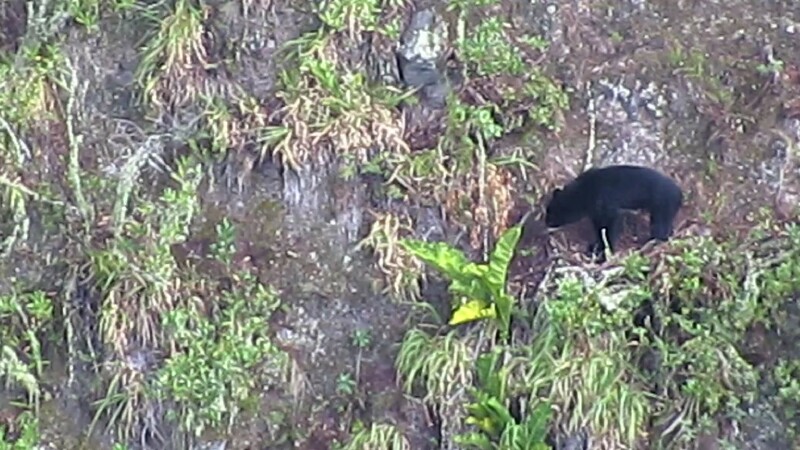 Later the two walked down an exposed slope, then disappeared into a forested gully. On the left ridge was a sow named Martina, who had 4 month old twins. They scampered playfully. We watched eagerly for hours on the first afternoon, but saw them only briefly the next morning. We camped right by the mirador. That evening, a woman walked down from her house on the hill above. She came to welcome us, bringing along her four dogs and a cat. Introducing herself as Miré, she stayed for a chat and asked if we had everything we needed. 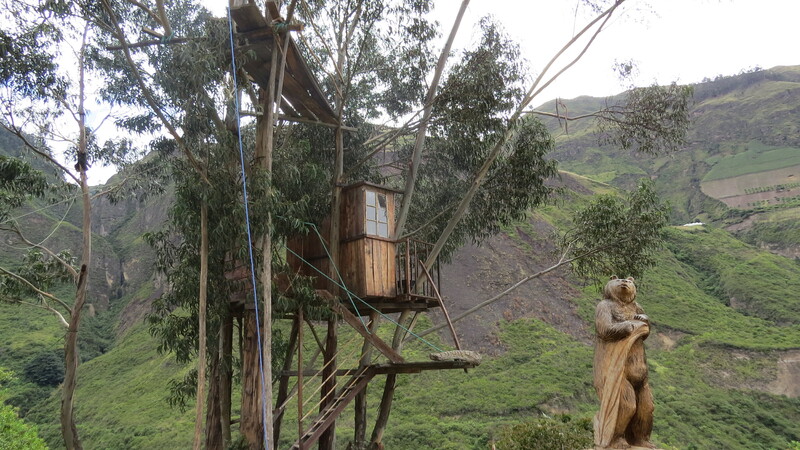 She pointed out the very rustic bush baño with its cement toilet bowl, the wood picnic table and the water tap. Then she offered to bring food if we were hungry. A delightful visitor, she had a big smile and a ready laugh. In the morning, we met the project administrator, Danilo Vasquez. He had constructed the viewing platform and has been involved with protecting the bears for many years, and through several generations. The spectacled bear is the only bear that lives in South America, and it resides primarily in the Andes. 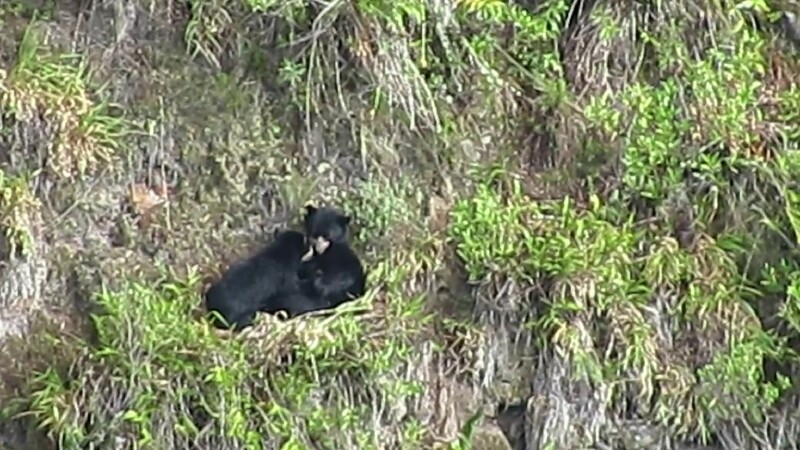 Unique white markings on each bear’s face led to the name of spectacled bear. To the right of the bear’s mountain, we could see the rectangle fields of corn and avocado trees rising high up another mountain slope. They went so far up they appeared like green and grey etchings in rock. 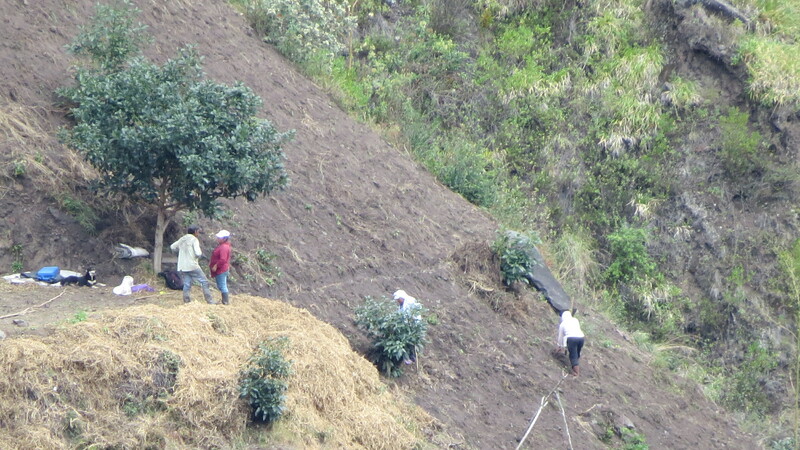 With binoculars we could see people hoeing, their slow movements revealing the difficulty of farming on such steep terrain. 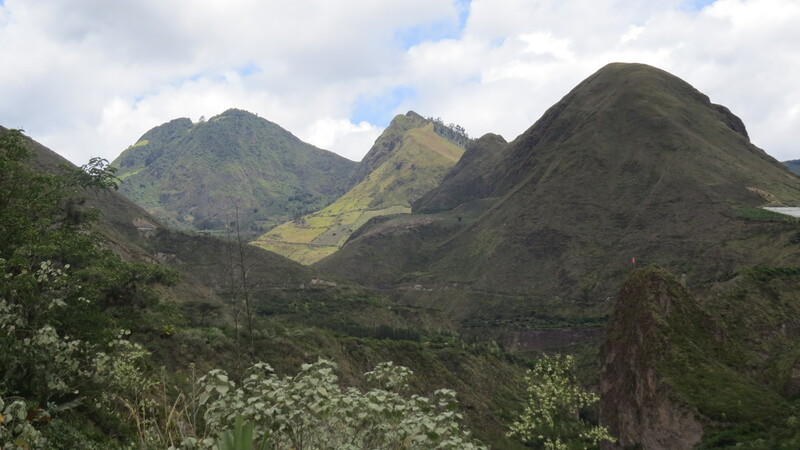 Before we left the Mirador, we learned why Martina and her twins had disappeared from their usual terrain that morning. Martina had discovered a mandarin grove, and the farmer was not happy. Danilo was worried, and set off to investigate. It’s a tough balance, keeping the bears safe and the farmers happy. We fervently hope for the bears survival. The Plan. Spend a week around the National Park of Cotopaxi, and hope to see the mighty Condor. Sounds like your best crossing yet.The cheapest for sure.Interesting stuff about the bears!